A world of meaning in these few (or no) words. A friend of mine has put it better than I ever could, "I keep thinking of the one she did a while back, where she says that she thinks she's the only one who understands her. Thing is, there hasn't been a single one of these that hasn't seemed totally normal and clear to me. There's nothing difficult to understand about this girl. She's not alone in any way. 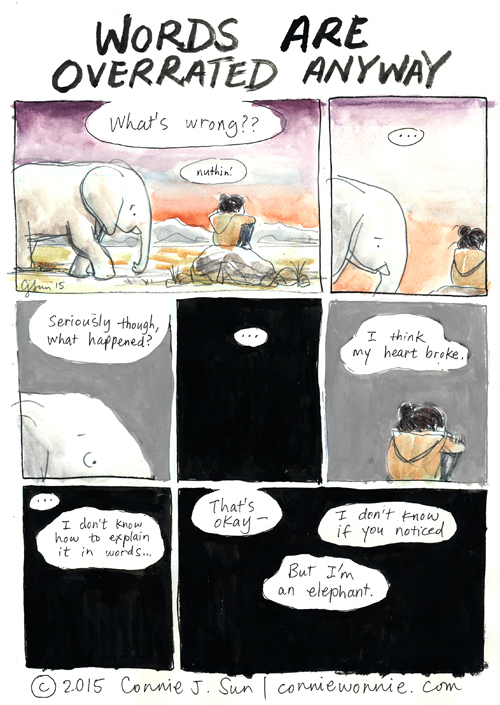 I hate to think of how many people sit alone, or with their elephant, feeling different and isolated, when they are surrounded by people who feel exactly the same way." In other words....I totally get you, and I know a lot of people who feel the same way. Elephant hugs all around.